Worth focuses his practice on commercial real estate transactions, as well as land use and zoning. His real estate transactions work includes leasing for tenants and landlords, easement drafting, and loan document review. Worth also advises clients on general corporate issues, such as entity formation, licensing and drafting operating agreements. With regard to land use and zoning, Worth counsels clients on legislative, quasi-judicial and administrative approval processes in the Wake County area. He has drafted numerous rezoning petitions, special use permits, and variance requests. He enjoys the community outreach and coalition building that is often necessary for successful land use outcomes. 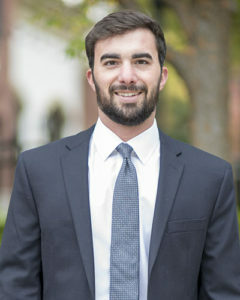 Worth earned his law degree from the University of North Carolina School of Law, where he was a member of the Holderness Moot Court Negotiations Team and Judges’ Chair for the Craven Competition. University of North Carolina at Chapel Hill, B.S.